This type lies wholly within the forest region and mainly in Loreto, Madre de Dios, Huánuco, Junin and Pasco departments. It falls within the category of mixed productive forests and, due to its relative accessibility, its flat terrain and the vigour of its growth, offers some of the best present and future potential for integrated forest exploitation. The upper storey reaches an average height of between 35 and 40 m. The undergrowth is relatively clear, except where an aggressive vegetation commonly called purma grows. The floristic composition is very mixed, forming a landscape with trees, shrubs, ferns, lianas and epiphytes. This type is located wholly within the forest region and mainly in Loreto, Madre de Dios, Puno and Huánuco departments. 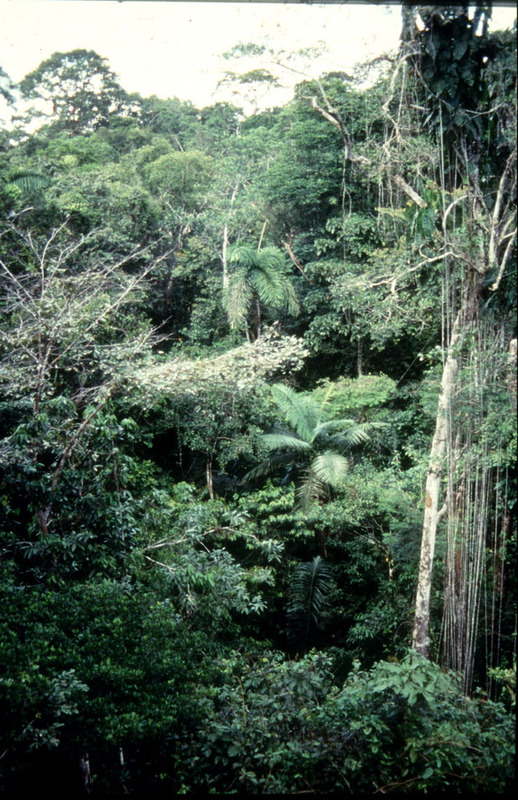 The climax forest resembles the previous type, but the dominant storey reaches an average height of only 30 to 35 m. The exuberance of the vegetation means that movement within the forest is difficult when the latter has been disturbed. 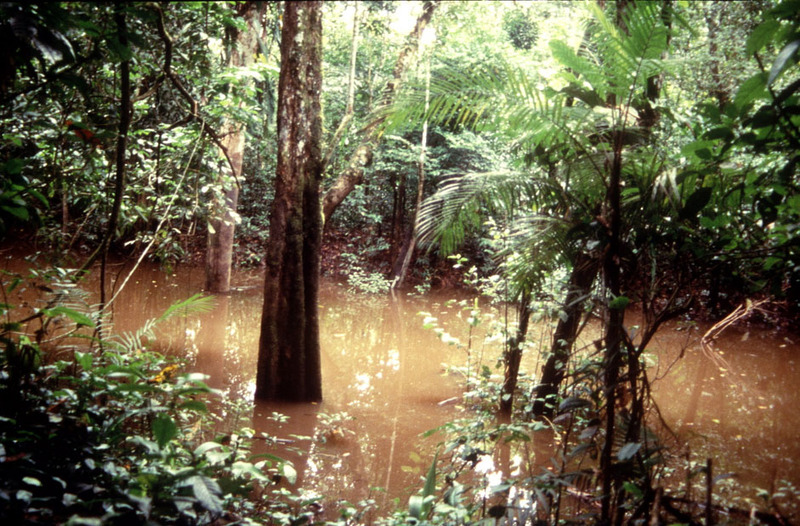 Since this alluvial forest is found on medium to low terraces, it may be periodically flooded, hindering transport. However, this factor works in favour of the wildlife, and of course the floristic composition is very similar to that of mixed productive alluvial forest mentioned above. 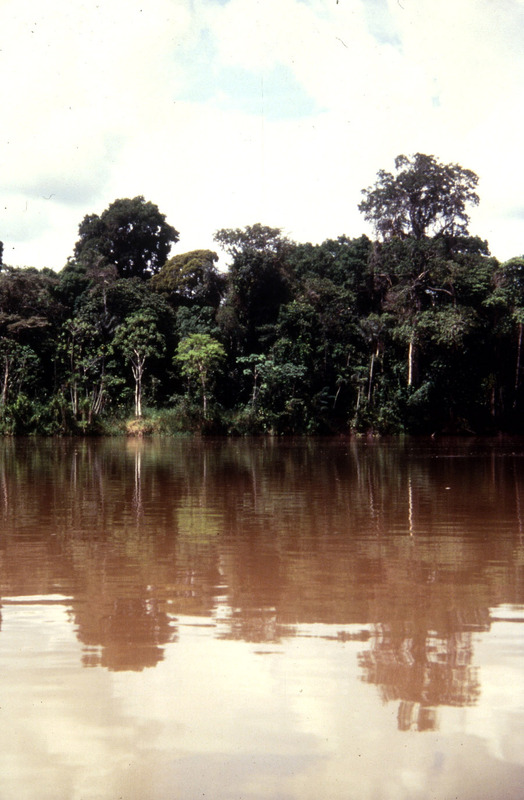 This is the second largest category of alluvial forest, located wholly within the forest region and mainly in Loreto, Madre de Dios, Amazonas and Puna departments. This type of forest is generally less vigorous than the previous types due to shifting cultivation practices, or intensive extraction of valuable species. It should be noted that the pure Cecropia sp. stands found in this type of forest have great potential for the pulp and paper industry. The Cecropia genus, a member of the Moraceae family, prefers alluvial, flood-prone terrain and grows remarkably rapidly, reaching a diameter of 5 to 8 cm in one year. This is one of the most widespread types of forest in the forest region, found mainly in Loreto, Madre de Dios, Pasco, Huánuco, San Martín and Junin departments on rolling terrain with moderate slopes and zonal and intrazonal soils. The vegetation is normally vigorous, but becomes slightly less so in extreme climatic conditions (abundant rainfall). The vigorous nature of the growth and the considerable area covered are the most forceful arguments for the potential of this type of forest. As in the forests already described, selective extraction is being practised, although the vast areas involved and the hilly nature of the terrain have hampered these operations and prevented excessive exploitation. It is described as a vigorous forest more closed than alluvial forest I. It has two distinct storeys, with a comparatively open undergrowth. This type is located mainly in the forest region of Loreto, Madre de Dios, Cuzco, Amazonas, San Martín, Huánuco and Pasco departments. It is the object of sometimes intensive selective extraction of high-value species, mainly in San Martín and Pasco, where there has also been major agricultural activity. This type of forest is moderately vigorous. This type is located mainly in the forest region of Loreto, Madre de Dios, San Martín, Amazonas, Cuzco, Junin, Huánuco, Pasco and Puno departments. The vigour of vegetation in hill forests is clearly in inverse relation to topographic conditions, with the lowest vigour found on the steepest slopes, and the highest on the most level ground. This type is located in Pasco, Loreto and Madre de Dios departments. Small scattered and degraded quinual (Polylepis sp) stands are found in the Andean part of Ancash and Lima departments among "subalpine moist paramo" and "subalpine rain tundra" environmental formations. This type is located on the northern coast of Peru, mainly in Tumbes and Piura departments. The most common species in closed dry forest are also typical of savanna-type closed dry forest, although in smaller proportions. These are confined to Tumbes department. The most common species is the red mangrove (Rhizophora mangle). The "aguajal" genus Mauritia is typical of the lowlands of the forest region (Loreto, Madre de Dios, San Martín and Huánuco Departments) and these stands have been placed in the natural life zones described by Tosi (1960) as "tropical moist forest", "tropical dry forest", "tropical wet forest" and "subtropical moist forest". Mauritia vinifera and M. flexuosa, species that some experts consider synonymous, form large pure stands suitable for exploitation for the production of edible oils, jellies, juices, fruit juice and stock-feed. They are found on dark brownish-grey or black, loamy-clay to clay, permanently flooded, hydromorphic soils. There are two types of stands, both closed and semi-closed, made up mainly of the species Mauritia vinifera and Euterpe precatoria. A special feature of Mauritia vinifera is its growth pattern, with an initial growth in diameter that lasts for some time until it reaches about 25 cm, at which point it starts to grow upwards. This leads to a great variability in height for each size of diameter. Between altitudes of 1 200 and 3 600 m in broken terrain with deep ravines and very steep slopes there is a type of vegetation containing at least two species of conifer belonging to the Podocarpaceae family and the Podocarpus genus, referred to locally as romerillo. Their density and volume of wood per hectare make them the dominant trees of the climax, which is why these forests are known as "Podocarpus forest" or "romerillo forest". There is some variation in terms of species and existing volumes of wood. In the Chirinos-San Ignacio area, species of Podocarpus is higher compared with Chontali area. The partial surveys so far carried out indicate the excellent capacity of this genus for natural regeneration, with trees of every age being found, ranging from recently germinated seedlings to adult trees, which gives a certain guarantee of the potential for permanent management.